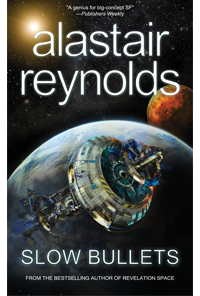 Slow Bullets is a sci-fi novella (around 50,000 words) by Alastair Reynolds. It’s a narrative apparently written by a woman called Scur. The narrative discusses her past life, as a soldier in an apparently long running war. After being captured and interrogated, she wakes up to find herself on a ship being used to transit war criminals for trial – but, not to give anything away, something has gone ever so slightly wrong. The remainder of the narrative slowly reveals what has happened, and why. The world, or rather, the ship on which Scur finds herself, is slowly revealed through the narrative. Both the ship and the society that produced it are explored in detail through the text – the latter mostly through character dialog. Scur serves as both the central narrative voice and the protagonist. We see some of her past through her own voice, innately unreliable as that is, but the focus of her character is on the developments aboard the ship in which she finds herself – events which define and change her. The supporting cast are more loosely defined –they’re available to advance the plot, but we don’t see much of them revealed, which is a shame – but given the length of the text, understandable. The prose is typical Reynolds, but in a unique voice for Scur – tightly wound, terse, and sparse. But each sentence has been crafted with Reynolds typical attention, and that makes it a pleasure to read. There are a couple of wider themes in the text, but the most central seems to be around memory, and the events that a person chooses to shape them, or allows to do so. The ‘Slow Bullets’ of the title are implanted in all of the prisoners on the ship, and carry their lives for them, their memories, everything that defines what and who they are. As the narrative progresses, the question becomes whether the bullets actually define the person in whom they sit, or whether a person deserves a clean slate, a chance to remake themselves. Overall, this is a wonderful Reynolds short. It’s clever, it’s well written, and it doesn’t make concessions to the reader – it demands their attention, and then wraps that attention into a vivid world and set of situations. Very much worth reading, if you’re in the mood for a hard-sci fi novella with some interesting questions to ask.